Sweetgrass Properties team members were very friendly, professional and helpful with all questions regarding our stay at the property. Fabulous property!! Views of the ocean were great! Clean and nicely decorated; enjoyed the master bath. Great villa for a girl's trip to the Isle of Palms and/or Charleston. Great experience! Power was disrupted due to a truck running into a power pole. I called the Sweethgrass properties telephone number, and received the information I sought in a polite and informative manner. Beautiful villa. Would stay again. Close to the beach-2 minute walk, but also had a property pool. Property was well maintained and beautifully landscaped. We loved that this property was recently renovated as well. It looked fresh and new. Everyone was very helpful - and extremely friendly. The email information a week before was informative and easy to follow. This property had been updated nicely and layout worked well - master upstairs, separate from the other two bedrooms was nice. The team was easy to work with, quick responses to questions, very professional! We have stayed in many houses at Wild Dunes over the last 7 years, and decided to try this condo due to location. 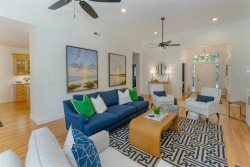 This is the first time renting outside of the actual Wild Dunes Resort management and Sweetgrass Properties did not disappoint. During our stay, I called about linens that were not in the unit, they were delivered at a perfect time when we were in the unit and well before they were needed for the night (sofa bed sheets). I felt the check-in and check-out process was so much easier then earlier years. I was concerned about the 10 am check out, but since I didn't have to go anywhere to physically check-out, it saved on time and we left at 9:30 am! This property had the perfect location of pool and beach from our 6 and 10 year old sons and our parents (70-80s). Everyone could walk to the beach and enjoy the ocean front views from the balcony. The unit was very clean, well appointed, and the design well thought out. Looks exactly like the pictures online, simple, updated modern, and beautiful. Very practical with plenty of hooks in bathrooms, lots of lights in different areas. All the TVs worked, which has NEVER happened in other houses in previous years. The rolling end tables/coffee tables were on wheels, perfect size for using and then rolling aside to make up the sofa bed. The queen sofa bed was a great size, comfortable to sleep on. My husband liked our car being under the unit away from the sun and easy to access. Full size washer and dryer was perfect. Ceiling fans in every room plus kitchen was useful. Master bathroom shower was awesome with 3 different shower heads. Everyone in our group enjoyed their stay. This unit was well thought out and designed for functionality. Of all the vacation rental organizations I have worked with over the past 20 years, Sweetgrass is definitely the best. Personnel were always very easy to contact and were very informative and accommodating. Excellent accommodations, excellent views, easy to reach. Excellent experience, clean, modern, overall beautiful! - we can't wait to be back. Great place, beautifully decorated, plenty of space, and great location. I would highly recommend this condo. I absolutely loved the property and all the amenities. The whole place is beautiful and we had an awesome time.